Building a new high-rise in an urban area presents an inviting target. For thieves who want to sell stolen equipment and materials, a high-rise building construction site can be a jackpot. Vandals may also sneak in for some graffiti tagging and other nefarious activities that could delay a project and move budget dollars to remediation. A robust security plan for high-rise construction will deter crimes of opportunity, as well as more sophisticated attempts to remove valuable items from job sites. With a comprehensive security strategy, construction site managers can protect all of their equipment and materials, no matter the value or size. Consider what equipment on your site is susceptible to theft and how you can protect it in advance. According to the 2016 Equipment Theft Report by the National Insurance Crime Bureau (NICB) and the National Equipment Register (NER), there are two key factors that determine the types of equipment most likely to attract thieves: value and mobility. Value, especially for easily moved items, is the top motivator. Large equipment like excavators may be more valuable but are much harder to move. The report states that wheeled machines are stolen more often than any other type of high-value equipment. Backhoes and skid steers are among the most stolen types of equipment because they are the most common machines on a site and are easy to move. For basic commodities such as lumber and wire, theft is often an inside job. Controlled access can reduce losses that result from employee negligence and theft. A highly visible defensive perimeter will change the mind of many casual opportunists looking to make a quick buck with a grab-and-go intrusion. Ensure that only authorized personnel have access to the heavy-duty locks on the gates. Keep the list of key holders up to date and in the hands of the lead contractors and security personnel. Use keycards, ID cards, or some form of identification to control access. Keep a personnel count in case of an emergency site evacuation. Work with a vendor that can provide Mobile Surveillance Units (MSUs) that use video and audio monitoring, as well as radar-guided cameras and thermal imaging. 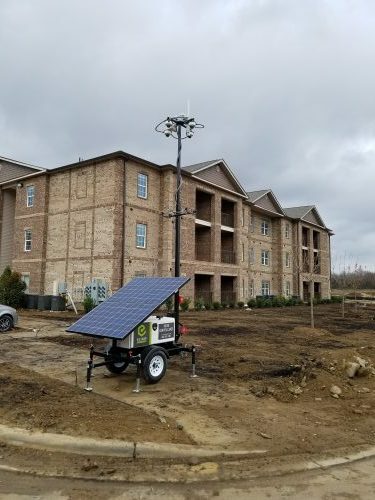 Smaller wireless surveillance units (WSUs) can be used alone or in conjunction with a central MSU to monitor large job sites. These radar-guided cameras require fewer units to monitor larger areas because the cameras can cover where they are needed most, rather than covering large, undefined areas. MSUs can also be armed with alarms and strobe lights that go off when an intruder is detected. Two-way audio communication lets remote monitoring parties verbally warn unauthorized visitors to leave the site. The MSUs are a force multiplier, reducing the number of guards required to keep watch. 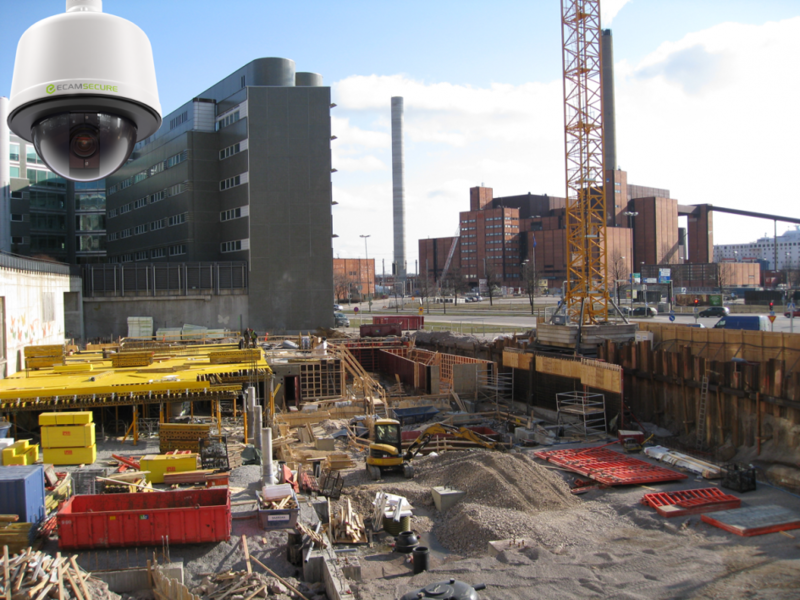 With a blend of MSUs and WSUs, even a large job site can be monitored effectively and efficiently without stretching the budget. A centralized command center provides professional monitoring and video sequences that can be archived on-site or remotely. Rapid video verification of an incident leads to faster police response. The monitoring system can also forward video clips to site managers. If the site manager verifies that a person on the property is authorized, that could eliminate a costly false alarm call to the police. On a long-term project, it’s easy to get complacent. But even a small lapse of protocol could lead to big losses. Take some basic steps to avoid costly mistakes that can be easily avoided. Inspect perimeter fencing, signage and anything else that might lose effectiveness from wear and tear incurred by the elements. Ensure that as subcontractors finish their work, their access is revoked. Maintain a record of key holders and duplicate keys. Park vehicles and valuable equipment in a central location so that they are easier to monitor. Stage materials in a central location that’s under the watchful eyes of your surveillance cameras. If you want to learn more about protecting high-rise construction from invasion and theft, our latest ebook, “The Complete Guide to Securing Your Construction Site—A Layered Approach,” goes over how to secure construction sites from both outside threats and inside threats.